The Oban Hotel has a prestigious seafront location offering stunning panoramic views. It has easy access to all local attractions. You will find Eastbourne's theatre-land and conference centre located within a 2-minute stroll. The hotel comprises of 30 comfortable en-suite bedrooms, each with TV/radio, hospitality tray and telephone. Many rooms have recently been refurbished to a high standard. There is a lift servicing all floors, a piano lounge and fully-licenced bar. In addition, we also have a sun terrace with seating and parasols so you can enjoy the breathtaking sea views whilst sipping a drink or enjoying your lunch. Our newly-refurbished and elegant restaurant awaits you, serving traditional English cuisine, with a lounge lunch menu also available. Our Christmas programme is now ready for your perusal. 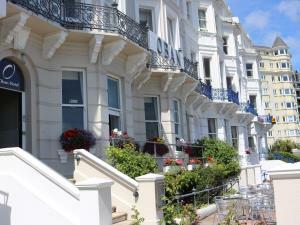 The Oban is situated on Eastbourne's elegant seafront, within easy walking distance of the main theatres and other attractions. M23 / A23 towards Brighton and then the A27 Brighton to Eastbourne road.